The RV Outside Lift from Harmar is just for RV owners. 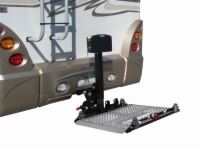 It has a special RV-type, heavy-duty hitch adapter and is compatible with hitches up to 22" from the ground, making it compatible with most RVs on the road today. Like other Universal lifts from Harmar, this lift is compatible with scooters and power wheelchairs. 3 year transferable warranty.